Doerte, a 60ish visitor from Germany, was staying at our house. Her ramrod straight posture and obedient grey bun lent her an air of sternness. She had graciously hosted my husband when he was teaching a workshop in Berlin and now we were returning the favor. On the third morning, she sat at our dining room table wearing a frown. Oh, Doerte enjoyed San Francisco’s museums and natural beauty, but she had one complaint. “There is no real bread here,” she said firmly. I was stunned. We had just rented a cute little house literally across the street from The Piedmont Grocery, which we affectionately called “the food museum.” Didn’t they carry everything, including scads of handmade sourdoughs? “Bread must have dark whole-grains and seeds…,” Doerte paused, “…for the digestion.” She put it as delicately as possible, but we got her drift. 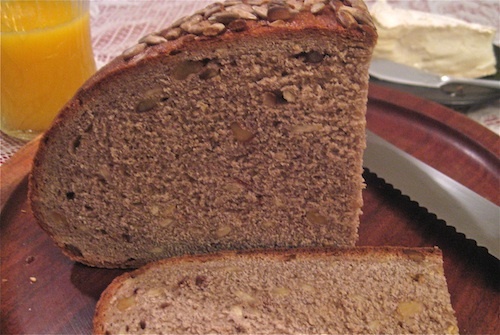 Germans are justly proud of their traditional dense, moist and chewy breads which come in hundreds of varieties made of whole wheat, rye, oat, spelt, buckwheat, linseed or millet, often mixed with sesame, pumpkin, sunflower, or poppy seeds. And that kind of bread was nowhere to be found. This interchange happened almost 20 years ago. If Doerte made a return trip now, she would be happily surprised to find that more than a dozen varieties of “real” German bread are finally available in the East Bay thanks to two local purveyors. Tucked away on University Avenue, a woodsy storefront the color of German Chocolate cake is the Berkeley home of OctoberFeast Bakery. Their densest Bavarian breads include boxy loaves of Multi-Grain (with rye, whole wheat, oat, buckwheat, flax, corn,and sunflower seeds) and a wheat-free Grains and Seeds (rye, oat with sunflower, flax and sesame seeds). OctoberFeast’s tables at Berkeley’s farmers’ markets are easily recognizable by the line of customers waiting patiently for their pretzel croissants. 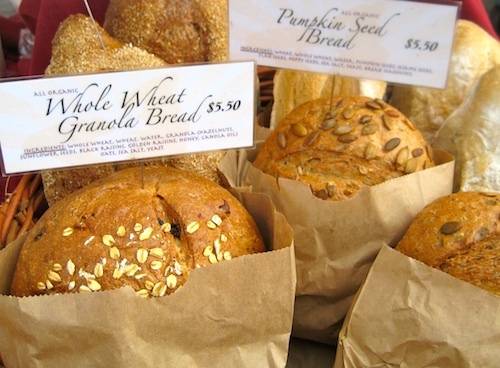 Other breads choices include rounds of whole wheat granola, pumpkin seed or walnut sunflower, as well as sesame or poppy seed sprinkled torpedo shaped loaves. The owners of Esther’s German Bakery , who moved to California from Germany in 1997, missed the breads they had grown up with and realized they had to make their own. Although based in Los Altos, they deliver daily to the Berkeley Bowl and make an appearance at Sunday’s Montclair Farmers’ market. My pick for the winner of the Seedy Olympics is Esther’s Steiner Bread (made from organic whole wheat, rye and pumpernickel flours, with rye meal, cracked rye, walnuts and flax, crowned with oats, sesame, sunflower seeds). Moist and chewy, its dense texture is the perfect base for avocado, cheese or jam, and provides a breakfast that will keep you full for hours. It is named in honor of Rudolf Steiner, the Austrian philosopher whose Biodynamic Agriculture predated “organic” farming. 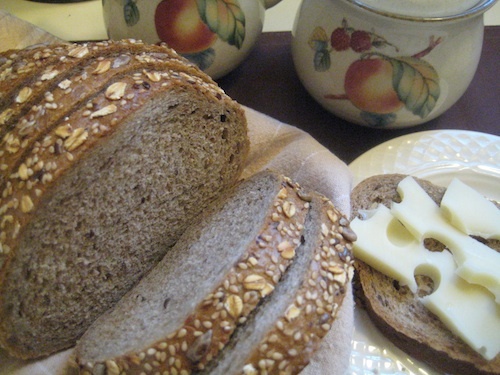 Additional offerings include a dark brown Russian rye, a lighter Fitness Bread (rye, wheat, oat bran and seeds), a German sourdough Mountain bread and an all rye, wheat-free Black bread. These traditional German style breads are hearty, complex, satisfying and well… good for the digestion. 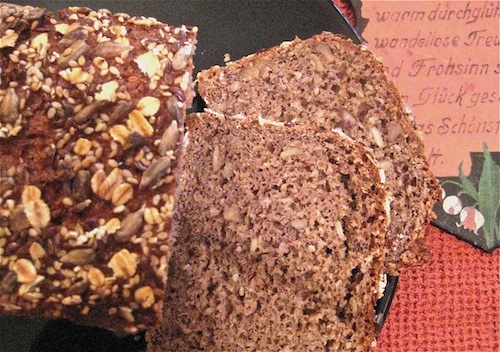 This entry was posted in German Food and tagged Esther's German Bakery, German breads, OctoberFeast, pumpernickel, rye bread, wheat-free bread. Bookmark the permalink.